Genuine Mercury Marine Part for Mercury Outboard Engines. Water Pump Impeller Repair Kit. Contains a genuine water pump impeller and impeller key along with all the necessary seals, gaskets that need to changed when replacing the impeller. To fit all Mercury 3.0L V6 2-Stroke outboard engines. 200hp thru to 250hp EFI / DFI / OptiMax. P/N: 47-43026Q06 This part number supercedes from. Genuine Mercury Marine Parts & Accessories. Mercury 3.0L V6 2-Stroke Outboard Engines. 200 (3.0L DFI)(DTS). 225 (3.0L EFI) SEAPRO. Quicksilver, by Mercury Marine, parts and accessories meet the same tough standards and testing as Mercury, Mariner & Mercruiser engines do. Splash Marine Supplies Your Port of Call for Knowledge & Service. Splash Marine Supplies Unit 3, The Bridgewater Centre, Robson Avenue, Trafford Park, Manchester, M41 7TE. 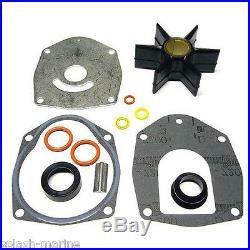 The item "Genuine Mercury Water Pump Impeller Kit 3.0L V6 2 Stroke 200 225 250 EFI/Optimax" is in sale since Tuesday, June 17, 2014. This item is in the category "Vehicle Parts & Accessories\Boats Parts & Accessories\Boat Engines & Motors". The seller is "splash-marine" and is located in Manchester. This item can be shipped worldwide.